This program demonstrates how lives would be impacted by a public health emergency, and more importantly, how lives can be saved during and after a public health emergency. The Greater Lake Erie West Triangle (Toledo, Detroit, Ann Arbor), like all large American metropolitan areas, faces possible public health emergencies. These include Bio-Terrorism, Infectious Disease, Chemical Attacks, Infiltration of Food and Water Supply, Nuclear Accidents and Radioactive Dirty Bomb Explosions. 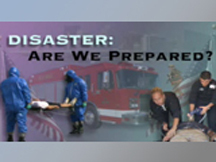 Although these topics have been covered in the news media, little attention is paid to the questions left in the viewers' minds; "What should I and my family do in case of an actual emergency?" and "Are the officials and authorities in my area ready to handle an emergency?" This program explores those questions. Produced by WGTE in Toledo.